Along with his gastroenterologist colleagues at the Century Medical and Dental Center in Brooklyn, Dr. Grosman has access to state-of-the-art diagnostic equipment and techniques. As a result, he makes an accurate diagnosis of the source of your symptoms. A gastroscopy, like a colonoscopy, is normally a diagnostic procedure. An endoscopic retrograde cholangiopancreatography uses both endoscopy and fluoroscopy to diagnose pancreatic disorders, such as gallstones and cancer of the main pancreatic duct and bile duct. After finishing his Bachelor of Science degree in Biology at Long Island University in New York, Dr. Grosman earned his Doctor of Osteopath (DO) degree from the New College of Osteopathic Medicine. 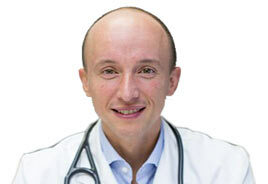 He completed his residency in internal medicine at the North Shore University Hospital NYU School of Medicine. He also completed fellowships in gastroenterology and hepatology in the North Shore-LIJ Health System. He was Resident of the Year in 2006 and Fellow of the Year in 2007. He lives in Brooklyn, where he’s been practicing since 2007. He is fluent in English and Russian, and he knows basic Spanish. Let Dr. Grosman treat your distress.